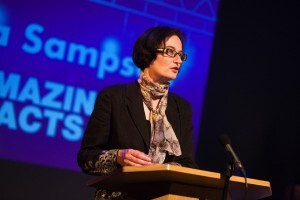 Fiona Sampson has been published in more than thirty languages. She has twelve books in translation, and has received the Zlaten Prsten (Macedonia) and the Charles Angoff Award (US), and been shortlisted for the Evelyn Encelot Prize for European Women Poets. From 2005 to 2012 she was the Editor of Poetry Review; she is now Professor of Poetry at the University of Roehampton, where she is the Director of the Roehampton Poetry Centre and Editor of Poem. A Fellow and Council Member of the Royal Society of Literature, Fellow of the Royal Society of Arts, Fellow of the English Association and Trustee of the Wordsworth Trust, her publications include twenty-seven volumes of poetry, criticism and philosophy of language. She has received the Newdigate Prize, the Cholmondeley Award, a Hawthornden Fellowship, Kathleen Blundell and Oppenheimer-John Downes Awards from the Society of Authors, a number of Writer’s Awards from both the English and the Welsh Arts Councils, and various Poetry Book Society commendations, and she has been shortlisted twice for both the T. S. Eliot Prize and Forward Prizes. Recent books include a new edition of Percy Bysshe Shelley for Faber and Coleshill for Chatto. Her Selected Poems have recently appeared in the US (Sheep Meadow, 2013) and China (2014) and are forthcoming in Ukrainian and Romanian. She is at work on a biography of Mary Shelley, and a study of musical form in poetry.